Moving to the new 9-1 grading system can be confusing; in Maths we use Pearson/Edexcel as our exam board. For more information from the exam board about the new grades see the video below. 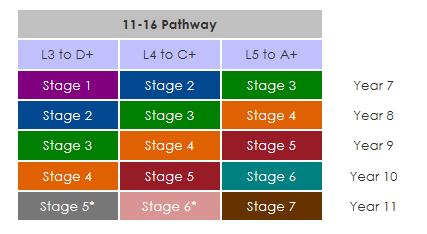 A * indicates a final year version of the scheme of work; for example, stage 6* is an abbreviated version of stage 6. The schemes of learning are currently being updated by us for teaching of the new maths curriculum for first teaching in September 2015.